Thank you all for patiently waiting on what has proved to be a monstrous undertaking by the folks at Immaculate Inning: the compilation of Did Your Job Stat for the whole Wild Card Era. We are indebted to retrosheet.org for their publicly available linescore data. The project is facilitated by Xenod (who wrote a program to parse the data and spit out a CSV file) and myself (who arranges the data in various configurations till something interesting leaps out). Agent Swag provides mostly moral support, intelligent questions, and the occasional cookie. While in the statistical realm such a graph might be referred to as "Shotgun," I believe that the trendline is real and is significant, particularly for pitching. One direction this analysis could take would be to identify some of the extreme outliers and examine these potentially interesting teams. For example, the 1993 Atlanta Braves had an unusually low DYJO% of 55.6%. Yet they won 104 games. Why? Because Greg Maddux, John Smoltz, and Tom Glavine led an extraordinary pitching staff to a DYJD% of 69.1%, second overall in our entire data set. One thing that kind of jumps out is the high percentage of teams from 1994 that appear on this list. 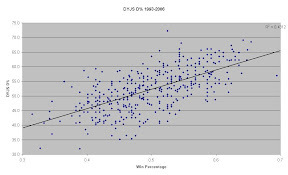 The strike-shortened season did indeed produce two teams with winning percentages greater than .700 (Expos and Yankees), but I cannot be sure whether there was not some effect from not playing games in September (For example, do the "callups" who frequently play in September Get the Job Done less frequently?). I will answer this and other questions in future posts. I would also like to adjust for the year, since the number of runs scored in 1993 is not the same as in 2006; nor is the average DYJS, I'm guessing. I will also try to normalize for home park factors, as suggested by poster Kiffy in the last DYJS post. extra ~0.14 runs, as opposed to the offense preventing the extra ~0.84 runs.